Allison Cobb isn’t interested in delivering epiphanies to readers. She’s interested in literature that opens a mystery and a sense of wonder, and offers a container for others to experience that opening. Plastic: An Autobiography, embodies that mysterious and wonderful opening. It was published as a free digital download by Essay Press in September 2015. The book is a part of their “EP Series,” (as in extended play) where authors are given extended space and time to develop book-length projects. 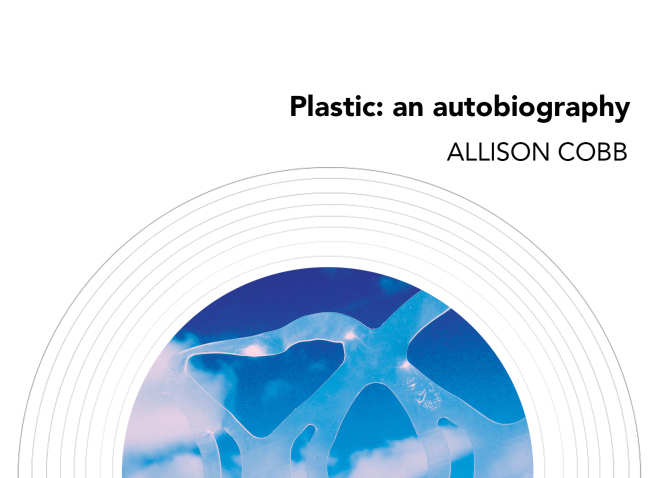 At the time of publication, Plastic: An Autobiography comprised of half the material Allison Cobb had written at that point. The project’s origins date back to 2006 when Cobb first encountered Susan Middleton’s photograph of a gutted albatross full of plastic. The bird ate all of the colorful plastic—more than five hundred pieces—was unable to pass it, and starved to death. The image embedded itself in Cobb’s brain. One bit of plastic especially irked her, a WWII era equipment identification tag from the United States Navy. Plastic: An Autobiographybegan as a book years later, after Cobb moved to Portland, OR; when a large piece of plastic, a fender from a Honda, wrapped itself around the fence in her front yard. After many years working for environmental protection groups, the suffocating omnipresence of plastic became inescapable. Because of the ubiquitousness of plastic, Cobb wanted to see if she could uncover a direct link between the plastic her body encounters and a dead albatross chick three thousand miles across the ocean. If that was possible, then she wanted to see how far the net of connectivity could be cast. By bringing these connections into writing, she hoped to uncover a way to exist on a planet that seems to be dying. She hoped the car part could be a catalyst of inspiration, which would lead to that better way of living. In the book’s introduction she admits that she failed to find an answer, and instead found only astonishment. This net of connections is as worldwide and inescapable as global capitalism. The bulk of the text focuses on four individuals: Stanislaw Ulam, a nuclear physicist and co-creator of thermonuclear weapons; Ensign Elwyn Christman, a Navy pilot who was briefly lost at sea in 1942 and belonged to the same squadron as the piece of plastic inside the dead albatross; Susan Middleton, photographer of the albatross; and Cobb, who’s personal experiences help bind the web of connections the book weaves. The book is divided into seventeen mini chapters. The narrative takes place over multiple interviews and shifts between first and third person perspective. Cobb also makes space for poems to illuminate her research. The reader gets a crumb of each person’s story, and is then plunged into another scene as soon as the former is set. The narrative of each person and the tangential moments that find their way in between—a story about the sea and an albatross is obligated to bring up The Rime of the Ancient Mariner—loop back and reveal how the lives of disparate souls across time and space intersect. The narrative of Plastic: An Autobiography swirls and oscillates like the soft plastic that makes up most of the Great Pacific garbage patch. Polyethylene is now the most common plastic on earth. Garbage. The title of the thirteenth chapter, which once meant the waste parts of an animal. Decay: to become food for something else. Plastic cannot be broken down by any life form and turned into energy, it can only get smaller and embed itself deeper into the earth and all of its inhabitants. A hydrogen bomb is five thousand times more powerful than an atomic bomb. Thermonuclear weapons were the primary source of dread throughout the Cold War, and they’re ability to end humandkind still looms. Yet thermonuclear weapons never brought about the destruction of all life. Instead, their byproduct polyethylene, is choking out many lifeforms on our planet while becoming an increasing threat to the wellbeing of humanity. The book connects distant people and their destinies, their accomplishments and their ignorance, which all expire, all decay. Plastic comes from the Latin plasticus and the Greek plastikos, meaning able to be molded. And it is ever malleable, it continues to persist. Humanity is marked by it, like a gravestone. By telling stories and connecting narratives, Allison Cobb has made a research project into a glorious work of art. If the rest of the book is as detailed and thought provoking, Plastic: An Autobiography could be her greatest work yet. It may not illuminate a new way to live, or a new truth about a planet that seems to be dying. But it certainly opens up a sense of mystery and discovery on a planet that before seemed entirely mapped out.